This year the Sweet Pea family will be spending Christmas morning just the four of us. I am really looking forward to it. I love my family and in-laws, but I have this special anticipation of having the morning together...like we are finally a complete family unit. If there were a national "Most Sentimental" search, I would be a shoo-in for the finals. I have a hard time if (most) family traditions don't continue. For ump-teen years, we always spent Christmas Eve at my aunt and uncles house after church, eating ourselves way-too-full with wonderful food. 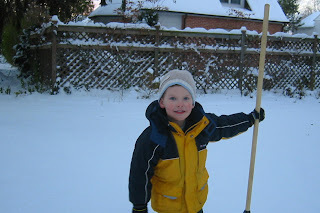 When they moved away 7 years ago, Christmas Eve just wasn't the same. So I am looking forward to starting some new Sweet Pea family traditions for Christmas morning. We already have some long-standing traditions that we will continue, but I am on the hunt for something special for Christmas morning...my only stipulation is that it is not an egg casserole. I am looking for something, savory or sweet that I can cook or at least fully prepare on Christmas Eve. These are my absolute all-time favorite cookies. This year I tried using Dark Chocolate (trying to find something redeeming for them) Kisses, and it didn't work so well. The one on the left is traditional, and well, you can see what happened to the dark chocolate one. Preheat oven to 350 degrees. After ingredients are all well mixed, shape into 1 inch balls, and place on a cookie sheet. Bake for 10 minutes, remove and place a Hershey Kiss in the center of each cookie and bake another 3 minutes. This is an easy, super healthy and yummy side dish that is good any time of the year. The marinade adds a bit of a sweet/tart taste to the vegetables that may help your little one want to eat more. Our older sweet pea gobbles up the kidney beans in this recipe. For a festive, Christmas-y look, use red peppers and kidney beans, to make this red and green. Mix the beans, onion and bell pepper in a large bowl. In a separate bowl mix the remaining ingredients. Pour the liquid over the vegetables, tossing several times. Place in the refrigerator for 3-4 hours before serving, to all the vegetables to marinate. My friend E emailed me about a good sugar cookie recipe. This one is as close to perfection as I have found. The secret ingredient? Sour cream. Also, be sure to make these cookies thick and under cook a bit, if you like them soft. 1. Combine flour, baking powder, baking soda, salt and nutmeg and set aside. 2. In a large bowl, cream butter and sugar, add the egg, vanilla and sour cream and beat well. 3. Add the dry ingredients to the butter, etc. 5. Preheat oven to 375. Roll out dough to 1/4+ inch thickness. Cut and place on cookie sheets. 6. Bake for 8 minutes, cool slightly and remove to a cooling rack. 7. Put on your inner Picasso and create some Christmas masterpieces, and then make sure to leave some out for Santa on Christmas Eve. I have a few Christmas cookie recipes that we make almost every year. This recipe is the newest one on our "must bake" list, but they are so good and so guiltless. Place egg whites and cream of tartar in a bowl and mix with an electric mixer at a high speed until the whites are fluffy and form peaks when you take the mixer paddle(s) out of the bowl. Slowly beat in sugar and salt until it is just incorporated. Fold in the chips gently. Preheat the oven to 300 degrees. Meanwhile, take 1-2 teaspoons of the mixture and dollop on a cookie sheet, pulling the spoon straight up to make a peak (should look a little bit like a kiss candy). You may want to use parchment paper or a Silpat liner on your cookie sheet, but it is not required. Cook at 300 degrees for 30 minutes. 1. Feed vegetable finger foods, especially ones for which your little one may not yet have developed a taste, first. Baby Sweet Pea hadn't been that into broccoli for weeks. Then I fed it to him first (and checked the consistency to make sure it was very well steamed) and bingo! he gobbled it up. Think of it this way--if someone gave you a plate of your favorite pasta and a plate of plain steamed vegetables, if you didn't know the nutritional importance of the vegetables (or maybe even if you did! ), you would probably would stick with the pasta. But if the vegetables were given to you when you were hungriest and you had no other options, you would probably eat them! 2. If you are still feeding baby lots of pureed food, alternate bite between less- and more- favorable foods. If I try to give Baby Sweet Pea nothing but pureed green beans, after about 3-4 bites, he refuses any additional beans. But if I alternate a few bites and then a few bites of any fruit puree, he tolerates the green beans. I am sure you might be going, "duh!" 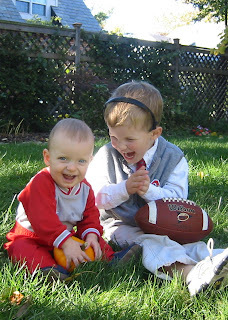 But for this busy mom, I had forgotten these two tricks and they have made a world of difference. It is still cold outside today. We may get another couple inches of snow tonight. Time to pull out the hot chocolate! Combine the milk and chocolate chips in a heavy sauce pan. Heat over medium low heat and stir occasionally until everything is melted. Alternatively, can be done in a slow cooker on LOW for and sit for 4-8 hours...just remember to stir occasionally. Serve with unbroken candy canes as a stirrer, or marshmallows on top. I think nothing can stir up a child's desire to try new things than making something fun or exciting. Tonight we are throwing some things on the grill. This is my husband's idea because we are celebrating his finishing the fall quarter of his second year of B school. I have no doubt that using the grill tonight for our dinner will be exciting for Older Sweet Pea. Why? "Grilling in the snow? That is so exciting!" I am trying to come up with a new cookie or two to make this year with our Older Sweet Pea. Our favorites are Peanut Butter Kisses, Gingerbread and some meringue ones I will post sometime soon. Anyone have a favorite tried-and-true that they are willing to share? My cousin M is a fantastic cook (no surprise since her parents are amazing--she had good teachers!). This is her mom's corn chowder recipe that she then lightened. It is a great way to sneak in some vegetables and tastes delicious. Seriously, you have to try this recipe. I promise you won't be disappointed. Stir until cheese melts but do not boil. I am sure you could add crumbled bacon on top, or other garnishes. Sweet Pea Husband wants to try it with some crabmeat too. I love bacon. I mean, I llllooooooovvve it. My older sweet pea is following in his mommy's footsteps. So in this lightened recipe I use the allure of (turkey) bacon to entice him into eating more peas. Enjoy! In a large pan, cook the bacon until very crisp, adding the garlic at the end to partially cook it. While the bacon and garlic are cooking, cook the pasta. Meanwhile, in a large bowl, combine cheese, pepper, milk, egg and egg whites. Whisk until frothy. Once the pasta is cooked, drain it and add it into the pan with the bacon and garlic (this helps pick up all yummy bacon flavor). Take some of the hot pasta and mix into the egg mixture (to bring the eggs up in temperature) before pouring all of the egg mixture into the bacon pan. Mix well over low heat, until the sauce binds to the pasta. Add sweet peas, and fold gently. 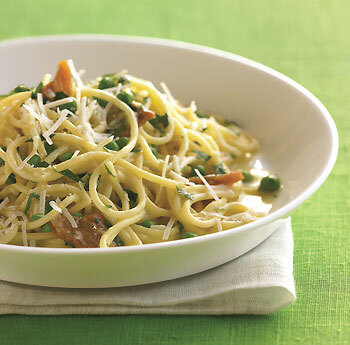 Just as a note: This pasta's sauce is lightened, so it isn't that creamy. If you are after a more creamy carbonara, may I suggest this recipe from Epicurious, complete with cream, egg yolks, butter and tons of cheese! Last year my older Sweet Pea learned a song to the tune of "Frere Jacques:"
Below is a recipe that I adapted from Rachael Ray that is super easy, healthier, all natural and uses less sugar. I even noted an alteration that uses cooked sweet potato to further pump up the nutrition. As I was preparing to make this recently, I was shopping at Trader Joe’s for hamburger buns and they only had hotdog buns. Then I had a “why didn’t I think of this before?” moment, and bought the hotdog buns. Voila! The mix stays in the bun: healthier, tastier and less messy Joes. Everyone is happy. What a great way to start the weekend. Roast the red pepper (cut in half, remove seeds and veins, flatten and place under broiler until skin is blackened) and wrap in foil. In a medium sauce pan, brown the beef or turkey with the onion. Once cooked, drain any excess fat. Peel and dice the red pepper. Add all remaining ingredients to the sauce pan *except* the buns. Bring to a simmer and let simmer for about 15-20 minutes. Serve in hot dog buns. Cook pasta shells per package. Drain. Rinse with cold water to cool. Drain well. Meanwhile, in a 5 to 6 quart Dutch oven, break up ground beef. Add bell peppers and onions; sprinkle with salt. Cook over medium high heat until beef is thoroughly cooked, stirring frequently. Drain. Stir in pesto, mozzarella cheese and beans. Fill each cooked pasta shell with scant ¼ cup beef mixture. Place 12 filled shells in each of 4 large (9 ½ cup) rectangular freezer/microwave-safe containers. Spoon ½ jar (about 1 ½ cups) of the pasta sauce over each to cover. Sprinkle each with ¼ cup parmesan. Cover; refrigerate up to 3 days or freeze up to 2 months. Thaw 1 container of stuffed shells in refrigerator or 24 hours or uncover and thaw in microwave on Defrost for 15-20 minutes. To reheat refrigerated or thawed stuffed shells, cover loosely and microwave on High for 6 to 8 minutes or until thoroughly heated. It is lunch time. The sweet peas are hungry. So I start a peanut butter sandwich for the older sweet pea while thinking of what we have on hand that I can throw together for me. I hand the baby sweet pea some Os to nibble on while I make the rest of lunch...I finally get the older sweet pea's lunch ready, and I start putting together the finger food/baby food assortment to feed the baby sweet pea. Meanwhile I am still hungry, so it is time for me to figure out what I will eat. I often feel as though I am choreographing a ballet of helping each kid eat, making my lunch and getting things each sweet pea requests mid-meal ("more milk mom!," "I need a napkin," "waaaaa."). Very often, I finally sit down to eat my meal, and just as I exhale and take a bite, I realize the steamed carrots are still in the microwave and the milk I poured for my 3 year old is still on the counter. Back and forth, back and forth, back and forth I go from the kitchen table to the counter. * For infants: Let them watch you cook from their highchair. Give them small amounts of safe and appropriate things you use while cooking. Examples: small amounts of flour, baking soda, baking powder to touch and explore. * For toddlers: Same as above, but some can start to help pour things into batter, salad mixes, etc. Explain simple concepts like, "The water is in the cup. Now mommy is pouring the water out of the cup and into the bowl." 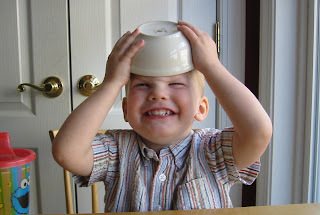 Start to explain relational concepts such as a cup is more than a tablespoon. * For preschoolers: Same as above, but this is where it can get fun! Help them understand numbers (ie, "we need three eggs in this bowl. We already have one, how many more do we need?") and math, and perhaps more fun (or messy!) let them stir, measure and do appropriate helping. Let them see how things change when you bake or cook them. Also, allow them to start to help prepare their own lunch and simple parts of dinner. * For school age children: Let them choose simple recipes that you can help them cook. Pizza is a great options. Help them learn to roll the dough, place the toppings and prepare for the oven. As children get older, who know you may just have a budding Julia Child or Bobby Flay on your hands. The options are really endless...any other great creative ideas out there for involving and interesting children in cooking? Alas, the growing season has passed us by...so the older sweet pea and I pulled all of our remaining vegetables yesterday afternoon. I was glad we did, for when we woke up, the roof over our porch was frosty and white. We grew poblano peppers this summer and we have quite a few left over to use tonight. This recipe is like many of mine--easily adapted to suit any taste. We do ours with poblanos since we all love peppers. But if you or your kids don't like spicy food, you can easily omit them. Like most many Tex Mex recipes, this one uses lots of "hidden" vegetables. A bonus: if your kid is not so sure of this meal, the chips on top should help convince them to try a "no thank you" bite! First, slice poblanos in half, seed and place skin side up under a broiler for about 10 minutes. Once skin is blackened, wrap in foil, seal and let sit for 15 minutes. Peel and place in the bottom of a 9 x 13 baking dish. Turn oven to 375 degrees. Mix all remaining ingredients except for chips in a large bowl. Layer the chicken mixture over the poblanos, top with crushed chips. Lightly spray chips with cooking spray. Bake for 20 minutes or until cheese bubbles. When serving, if you don't like spicy food, leave the poblanos in the pan for someone who does! Also, this week's Newsweek is all about children and food allergies. Just in case anyone wants to check it out. I plan to read it later this week. Oh yeah, I'm the nurse. I have been playing Nurse Sweet Pea since yesterday morning when I took my small sweet pea to the doctor for a regular check-up and found out he had a double ear infection! Then, my older sweet pea comes home from school, whiny and begging for a nap. Huh. He wakes up out of sorts, so you guessed it, back to the pediatrician we go and yep, he has a double ear infection too! Only the second in his life...guess the boys are good at sharing some things. ANYWAY, I did not cook tonight since I woke up feeling sick and have no energy. Plus its the weekend! So instead of the usual "Friday Night Bite" recipe, here is my suggestion for a fun, easy and healthy meal: The result? Everyone's excited, I don't have to really cook and I can feel good that I gave them at least a pretty decent meal while they are under the weather. Would have done another soup, but that was our lunch! My parents are on their way to the SP house as I type. Hooray! Hubby and I have a night out so I am running to the grocery story to get some things for an easy dinner tonight for our older sweet pea...this is one of his favorites. Who doesn't like pizza and pasta together in one meal? Preheat the oven to 400 degrees. Cook pasta, drain and let cool. In a large bowl mix egg whites and milk until frothy. Add 1/2 cup cheese, garlic, salt, pepper and oregano. Add pasta and mix well. Pour into a 9 x 13 pan, coated with cooking spray. Bake for 15-20 minutes or until mixture is set and slightly browned. Top with spaghetti sauce (may not use the entire jar), remaining cheese and toppings. Return to the oven until cheese is melted and bubbly...usually about another 15 minutes (depends on how many toppings, etc). Preheat oven to 350 degrees. In a large bowl, combine the flour, sugar, baking powder, baking soda, salt, nutmeg, cinnamon, and ground cloves. In a separate bowl, mix the eggs, pumpkin, and applesauce, until smooth. Add this mixture to the dry ingredients and stir thoroughly to make a smooth batter. Stir the raisins and walnuts (if using) into the batter. Spoon batter into greased muffin cups. Bake for 30-35 minutes or until a toothpick comes out clean. I mean really, the whole "Friday Night Bite" name is corny in and of itself. 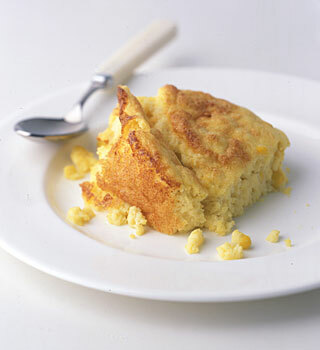 Here is a corn spoonbread that is a lightened version of my favorite (Jenn's recipe) spoonbread. Easy to make and extra yummy, no one will ever know it is lightened. I am making some tonight with a pork loin and broccoli. Preheat the oven to 350. Combine all ingredients, pour into a square baking dish, coated in cooking spray. Bake for 45 minutes or until set. Here is the recipe (sans beets) that I used Tuesday for my experiment with beet puree. It is wonderful (actually won a neighborhood chili cook-off when we were living in Virginia) and can be whipped up quickly or allowed to simmer all day in a slow cooker. In a large pot, brown onion, sausage and meat. Drain fat. If doing a slow cooker, place meat and onions and all other ingredients in slow cooker on low and cook for at least 4 hours, but can be left all day. If doing it "fast," add remaining ingredients, bring to a fast simmer, and reduce to low, cover and simmer for 30 minutes. So after yesterday's comments and post, I had an idea. I just happened to have some chili simmering in the slow cooker. I also had a can of beets that had been gracing my pantry shelves for way too long. Result: The unsuspecting Sweet Pea and my husband ate it up! I have to admit, in something as flavorful as chili, there was virtually no taste difference. But it was fun to experiment. The only thing is, I wonder if I would stick with this puree business consistently. I had a major revelation doing this...it is just like making baby food for the younger Sweet Pea...which while I enjoy doing this when I have time, I am not too sad about beginning finger food and leaving the puree stage behind me. This has been a looooong week for this sweet pea chef. My wonderful husband takes night classes two nights a week this quarter, and he was gone another night for a team meeting. Today he is gone all day and into the night at an annual charity golf tournament that he organized. So all good reasons for being busy, but oh-my-goodness it has been a long week. I will spare you all the details, but it is has involved a trip to the doctor, a flat tire on my way to pick up my three year old at preschool (thanks Shannon for getting him! ), and to top it off, our air conditioning/HVAC unit broke yesterday and it is supposed to be in the low 90s all weekend! Not your typical Ohio October weather, can you say, "Global Warming?" SO...we are headed to eat out tonight. I am not cooking when it is this hot with no AC. But I wanted to share one of my favorite recipes for Teriyaki Chicken Thighs and Soba Noodle Vegetable Salad. These are two great easy, flavorful recipes for you to enjoy! They are Candy Corn Popcorn Balls, which I think look really yummy, and so fun for a special fall treat. Thought I would share the recipe, since they seem easy to make and might be fun for some of you too! Our 8 month old is starting to get the whole finger food process. I love to watch him try and grasp the Os with his chubby fingers, and concentrate so hard to get them in his mouth. Sometimes he is so proud with what he has accomplished, he smiles huge, and then the O falls right out of his mouth. We've also tried banana, avocado, ripe pear, ripe mango, steamed carrots and peas, egg yolk and tiny cheese cubes. What a mess...but what fun too. Any other ideas on good and easy finger foods at this age? I feel like I use the Os far too much since these are the easiest for him to grasp. Each Friday we try and make a dinner that is fun and a real crowd pleaser...to celebrate the end of the week and beginning of the weekend. 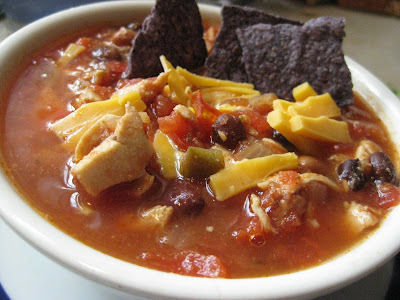 So here is a great and easy fiesta chicken taco soup that is my absolute favorite slow cooker recipe. Place the first 7 ingredients in the slow cooker and mix well. Place chicken breasts on top of the ingredients and cover the slow cooker. Cook on high 4-5 hours, or low 8-10 hours. Remove the chicken and cool on a cutting board while you prepare the cheese, sour cream and crushed tortilla chips. Once chicken is cool, shred or cut up very fine, mix back into soup. Serve soup in bowls, and let the kiddos do their own toppings! My 3 year old's preschool, much to my amazement, did not have a "no peanut" rule in place as no one in the entire school had a nut allergy. So last spring, when he was old enough to stay for lunch bunch, I joyfully and quickly made him a PB (he isn't that into the J) sandwich each time for school. Mix and place in a pita. Yum yum. 1. Take one slice of bread and place it on the plate. 2. Spread peanut butter (we like crunchy right now). 3. Have mom slice bananas or other fruit and open some dried cranberries or other dried fruit. 4. Arrange fruit and dried fruit in any design that suits you. This is fun because sometimes we do letters, numbers, or designs (ie, smiley face) on the peanut butter palette. It almost becomes an edible craft experience, and the best part is there is no clean up since it all ends up in their bellies! Amuse what? Amuse Bouche (A-moos Boo-sh) is french for "pleasing to the mouth." Usually it is a small little pre-appetizer at fancy restaurant. I am using the term for a weekly recipe I have tried that is a real family pleaser. Chicken parmesan is a perennial favorite. This version, that I developed with some ideas from a friend, is healthy, tasty and really easy to make. I usually double the recipe and stick one in the freezer for a go-to meal on a busy night. Preheat the oven to 350 degrees. Combine first four ingredients in a shallow bowl. Place egg in another bowl. Take the chicken and dip in the egg and then dredge in the flour mixture. In a nonstick skillet over medium high heat, pour 1 T of the olive oil into the pan. Add chicken for about 5 minutes on each side and then place each piece of chicken in a 9 x 13 baking dish as you complete it, overlapping as necessary. You may have to do a second batch of the chicken in the skillet (use the extra 1 T of olive oil if another batch is necessary). Once chicken is done, pour the spaghetti sauce of the top and then finish with the cheese. Bake uncovered at 350 for 15 minutes, or until the cheese is bubbly and slightly brown. Serve over the pasta of your choice. No, not swimming in your birthday suits; a healthy, tasty and easy snack that kids will love and that is a great alternative to all those tradition foods of football. Mix the refried beans and salsa and spread at the bottom of pie pan. Mix sour cream, chili powder and cumin and layer on top of the bean mixture. Top with cheese, onion and then tomato. Squeeze lime juice over avocado, to prevent browning. Add avocado on top of the tomato and then top with olives. If you are looking for a good way to pump up the spinach (and iron--read yesterdays post) in your kid's diet, here is a really yummy and easy recipe. These taste like spinach and artichoke dip in a calzone. Calzones used to intimidate me for some reason, but they don't anymore! Preheat your oven to 400 degrees. Combine the walnuts through the olive oil in a food processor and blend thoroughly. Roll out half of one ball of pizza dough in a circle. Take 1/4 of the mixture and spread on one half of the calzone. Top with 1/2 cup mozzarella. Making a half moon shape, fold the other half of the dough on top and then pinch the two sides together (use a bit of water on your fingers to help make this part work better). Place the calzones on 2 cookie sheets and bake for 15-18 minutes. As I have mentioned before, this is the first summer we have had a "real" yard to grow vegetables. Our zucchini crop is out of control, so we tried this recipe I adapted from a Rachael Ray recipe to help use our bumper crop of zukes. This recipe for zucchini fritters is fantastic because it uses zucchinis in a fun way, and the dipping sauce is vegetables too! Most kids love anything they can dip, so it is another easy way to find creative ways to add some vegetables to their diet. Grate zucchini in food processor or grater. Place in colander, mix with salt and let sit. After about 20 minutes or more (depending on how much time you have) press with a clean towel to remove all the water. Wisk the egg whites, add the zucchini, then the flour, and pepper. In a large nonstick pan, heat about 1 T olive oil (or use non-stick spray) over medium-high heat. Drop the fritter batter by rounded tablespoons, into the the heated pan and flatten. Cook for about 2-3 minutes and flip and cook again. Once each batch is done, you can keep them warm in an oven at 250 degrees. Rinse the food processor and puree the red peppers with the garlic and 1 tablespoon olive oil. Serve the dip with the warm fritters. I don't know about you, but one of my favorite easy peasy dinner ideas is to do breakfast for dinner. This is a pancake recipe that I make regularly for breakfast/brunch (usually on the weekends when my wonderful husband can help corral the kids while I whip them up) but can also be used for a fun dinner. This recipe is super easy, and you can add blueberries, banana slices, apples, peaches, etc to them. I have even added steamed little chunks of sweet potatoes! Just add the fruits or vegetable once the batter is in the pan. Combine dry ingredients. In a separate bowl, combine wet ingredients. Add the wet ingredients to the dry ingredients and mix until *just* blended (there will be little lumps--that's ok!). Preheat a nonstick pan to medium heat. Pour the batter into the pan (add fruit, etc if desired), wait until the pancakes are covered with little bubbles, and flip and let cook for 2-3 minutes longer. My son loves pickles right now. They count as a vegetable, right? So, we recently created this idea for a new lunch "sandwich." This recipe also uses the pre-shredded bagged carrots. These are such a great, easy peasy way to sneak carrots into lots of different things. I have cooked them with refried beans, spaghetti sauce, soups, etc. Some brands are thicker than others, so you might want to give them a good rough chop first, just to get them easier to hide. After dicing the pickles, set them on paper towel to absorb extra moisture as you prepare the other vegetables. Mix the first five ingredients, spread on the tortilla. Roll up the tortilla like a spiral, cut into 1 inch pieces. You can add really any veggies you have on hand; popping the cream cheese in the microwave for 10 seconds makes this mixture a snap to spread. This would be great for a back to school lunch! Cook the pasta, drain and add all the other ingredient and toss. Easy as can be. You can add diced meat, or do any combo of veggies...red peppers, celery, shredded carrot, small florets of broccoli, etc. Did you hear about the recent study on the effects of food marketing to children? In a nutshell, 3-5 year olds tasted foods, some packaged with a McDonald’s logo on it and some that was in neutral packaging. Despite the food being identical in each package, overwhelmingly the children chose the McDonald’s food as being tastier. What does this say about the power of branding on the preschool set? The lesson here for me is that children pick up on everything! If your child is exposed regularly to fast food, of course they will develop a taste and perhaps become a Arch-a-holic. So I am trying to use the power of persuasion in more positive ways and expose them to foods that pique their interest healthfully. And I know I am not the first person to type this…there is no better influence on their eating habits than YOU. Whether this thrills or scares you, if you walk the walk, the more likely you are to have little ones following behind you. Preheat your oven at 400 degrees. Place a couple tablespoons of the rice and beans on one end of a tortilla. Top with about a tablespoon salsa and sprinkle with 1-2 tablespoons cheese. Roll up, pulling in the sides as you roll to bake your burrito. Lay seam side down in a baking dish (9x13 usually fits the bill). Once your pan is full, brush the tops of all the burritos with olive oil or vegetable oil. Place into the oven for about 15-20 minutes, or until the tops are golden brown. Remove the pan, sprinkle with an additional cup or so of the cheese and place under the broiler for just a minute or two to melt the cheese and make the burritos extra crispy. These are so good, and again, the sky is the limit on changes, alterations, etc. *Saute a chopped small onion, 2 cloves of minced garlic and one 15 oz can of black beans in a sauté pan with about 1 teaspoon of vegetable or olive oil. Once cooked you can add 2-3 teaspoons of hot sauce and cilantro, cumin, salt and pepper to taste. –OR- just by a 15oz. can of black beans already seasoned. Place first three ingredients in a sauté pan with no oil or butter over medium high heat. The vegetables will all start to char a bit, a la fajitas. Once they are blackened, remove and let cool for a few minutes. Place into a food processor or blender with a handful of cilantro (no need to chop) and about ½-1 teaspoon salt. Voila, fresh salsa. Again, try having your kids help with the blending…lots of fun for the preschool set. After countless conversations with friends and family, I have finally done it. I decided to set up a format to share what I have been asking for these past months…ways to help us all eat healthfully. Am I looking for recipes? Yes…but so much more: new ideas for meals, thoughts on nutrition, experiences from your homes and maybe even tricks to keeping your kids eating healthy. I have learned so much from my friends, hopefully we can all share and have a place to come to when we need another…meal…idea. So many kids are only exposed to a diet of typical kid (read: bland, boring) foods. In our house we can fall into the lunchtime PB&J routine. I think it is easy to get stuck permanently in a rut of kid-friendly cooking and miss out on a whole world of eating adventures. Put into a blender and puree. Pour into 8 popsicle molds, add sticks and freeze. These are so easy to make and have no added sugar. I do all sorts of fruit combinations, just whatever I have on hand. As an aside: My 3 year old love, love, loves using the blender. Maybe the noise reminds him of a truck or other machine, but regardless, he loves to blend. Use this recipe not only to make a healthy treat, but to involve your little one and create an early love of cooking.